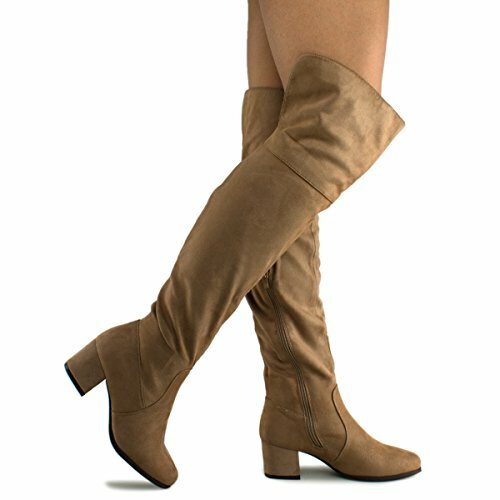 PERFECT FIT AND STYLE: Versatile, over-the-high boots have a simple, sleek upper made out of vegan suede and a low, a stacked (2")heel adds some inches to your look. Perfect for festivals and year round wear! DURABLE LONG LASTING COMFORT: Effortlessly slips these on and off. A sturdy rubber outsole ensures maximum comfort through prolonged wear. A short ankle heel (2") adds to perfect and comfortable look and feel for your legs. APPROX MEASUREMENTS: Heel Height: 2" ; Shaft Length (including heel): 26.5"; Top Opening Circumference: 12"